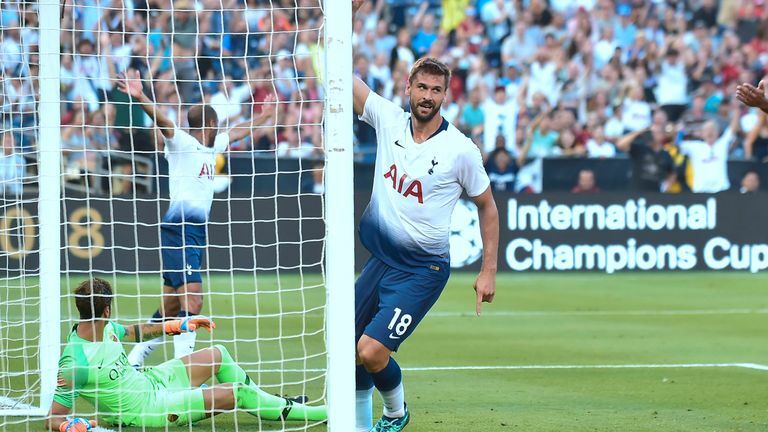 Harry Kane says Fernando Llorente made a difference when he came off the bench in the Champions League win over PSV. Mauricio Pochettino's side failed to win any of their first three Group B game but came from a goal down to beat PSV at Wembley, Kane scoring both with his winner coming in the final minute. Kane said: "It has kept us alive but now we have got to try and make the most of that - and that is to try and win the last two and qualify. "We are still there in the Champions League, we have got hope. Inter Milan are here next at Wembley, we have got to make sure we do the same. "Barcelona here, we played well [in a 2-4 loss]. We didn't get the result we wanted but, if we win the next one, that will give us belief [for the game at the Nou Camp]. "One game at a time, here at Wembley next - it's definitely a winnable game for us." The Wembley pitch remains in a poor state following last week's NFL game and PSV boss Mark van Bommel was critical of its condition after the match. Kane said: "It is the same for both teams. We had to play on it, they, had to play on it. "It is what it is. It is not ideal, everyone knows that and we know that, but what can we do? "The situation we are in, we just have to get on with it. "You could say we were a bit unlucky against Manchester City because of the pitch - it is what it is and we just have to get on with it."